April is National Grilled Cheese Month. I know that every day there is some ridiculous food holiday, but this is one that I have no problem celebrating. Hands down, my favorite Grilled Cheese (except one from mom or grandma) comes from Mr. Graham Elliot of Chicago. This delicacy involves white Pullman bread, Wisconsin cheddar and cheese curds, prosciutto and then – tomato marmalade. I found a recipe for this gem on a site called Made Man, so I’m sharing a link to it here. The key ingredient – the marmalade takes about 5-7 hours to make! Eek!, but seriously – it’s worth it! This sandwich makes its way on to my short list of reasons that I’m glad that we don’t live in Chicago anymore…because I would seriously eat this weekly. Oh and I borrowed this imaged from Food & Wine to illustrate this mouth-watering sandwich. 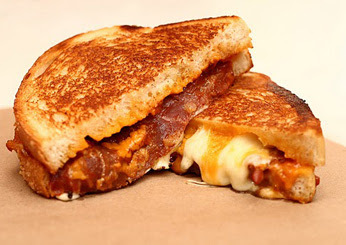 It’s part of a slideshow on the Best Grilled Cheese Sandwiches in the U.S. – check out the list to see if there is a joint near you listed!